Welcome to BALE' 1218 located within the 5 star Peppers Bale ... The ultimate luxury escape at the magnificent Salt Village, Kingscliff. NB: All images in this advertisement are of the actual apartment that you will be staying in. This apartment is sure to impress with a gourmet island style kitchen complete with stone bench tops, breakfast bar, stainless steel Miele appliances, fridge freezer with ice-maker, plus separate wine fridge. Relax outdoors on the expansive balcony complete with outdoor dining table and separate lounge area. The balcony is designed for use all year round with large built in glass windows that simply slide open on a perfect sunny day or close up in the cooler weather, rain or shine. This truly is the perfect place to unwind at the end of the day and watch the astonishing sunsets Salt Beach has to offer. Beautifully decorated by "Robertsons Interiors", this luxuriously appointed apartment will comfortably sleep 6 people. Standard bedding in this apartment is a KING BED in the Master Bedroom, Bedroom 2 - KING BED, Bedroom 3 - TWO KING SINGLES. Bedroom 3 can easily be transformed into another KING BED if required at an additional cost of $20. Please advise upon booking if this is required. The master bedroom displays true elegance and style, your private ensuite boasts an alluring double spa, double vanity and separate rain head shower. You can both unwind and take a relaxing spa with views through the master bedroom over the balcony to the ocean. The master bedroom also opens up onto the main entertaining balcony where you are greeted by a comfortable lounge area perfect for a late night glass of wine and chocolate indulgence. In the morning wake up to the sounds of the ocean.... truly relaxing. Our apartment is equipped with a Bose 321 surround sound system, CD/DVD with large plasma TV in the living room with Foxtel access. The master bedroom and Bedroom 3 has a large wall mounted TV. As a guest you have exclusive access to the private 20m heated pool, spa and lounge area exclusive to Bale' owners and guests. You will also enjoy access to the adjoining Peppers Resort which hosts a lagon style pool, tennis court, gym and hotel bar. 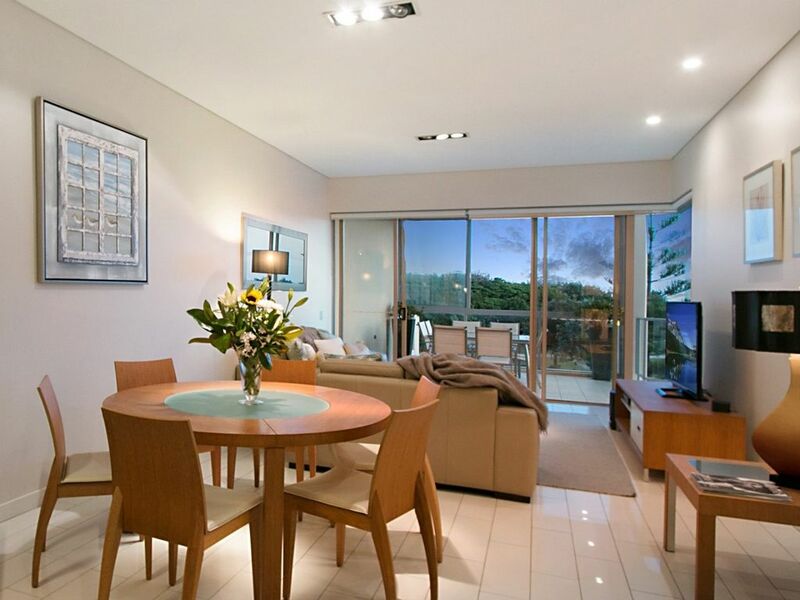 There is absolutely no doubt this will become your home away from home, you won't want to leave our stunning family owned apartment and you will want to come back time and time again. Salt beach is patrolled by the Surf Lifesavers. Salt Village's eclectic mix of bars and restaurants has a cuisine to cater for even the fussiest eater. Everything is walking distance, so park the car and forget about it. Some restaurants offer a take away menu for pickup or delivery. Be everywhere or nowhere. Have the type of holiday you want and need. It is all on the doorstep of Bale' 1218. We look forward to welcoming you to our resort apartment in the near future. Please email me if you have any questions. Seasons Restaurant: The acclaimed Seasons restaurant, located at Peppers Salt Resort & Spa, offers a stylish and casual dining experience with a focus on fresh produce and merging mouth-watering flavours from New South Wales and Queensland. Fins Restaurant & Bar: Multi-award winning and internationally renowned chef, Steven Snow, continues to carve out its reputation as one of Australia's hottest restaurants. Mahsuri Thai: Choose from a tantalising selection of tasty Thai cuisine complimented by a premium selection of fines wines or cocktails. If you not in the mood for a dine in meal, then select from the delicious take away menu. Sea Salt Ristorantee Pizzeria: Experience the true flavours of Italy with a Sea Salt pizza, baked in the traditional pizza oven. Bellini Mediterranean Cafe & Bar: Offering authentic Italian and Mediterranean cuisine. Salt Bar & Grill: The ultimate bar and grill, for lunch, dinner or meet friends for a drink, with seperate children's play area. Saltbean Coffee, Piccolo Gelati Bar, Fish & Chips and much more. Relax and enjoy a treatment at the Golden Door Spa or Silk Beauty. The Salt Village precinct also has a Salt Cellars Bottle Shop, Hairdresser, Witchery and Sunburn for fashion. The Salt Spa within the Peppers Resort, Kingscliff offers luxury spa facilities and a range of health and wellness programs to rejuvenate the body and mind, offering a wide range of treatments. Bookings are essential. Also located within the Salt Village precinct is Silk Beauty offering a wide range of treatments also. We were so grateful to have such a nice and spacious apartment given the rain. The biggest bonus is the heated pool and spa in the complex. There were enough restraunts in walking distance and the walk to the beach when it wasn’t raining was gorgeous. Maybe the weather might be kinder at our next stay. Great pools, apartment, facilities etc. Very comfortable spacious unit at a fabulous location. Robyn was so accomodating and the unit had everything you need. It was all a great recipe for a relaxing holiday. This is a lovely apartment, well suited for a small family and couples. Nicely laid out and amenities are fabulous. Salt Village is a terrific location for families with most restaurants being family friendly and a few more well suited to couples. Peppers Bale is lovely, pool is beautifully warm and you get access to the Peppers hotel and pool there. Beach is simply amazing. We're looking forward to visiting again. We enjoyed our stay in Bale 1218. The three bedroom apartment is well laid out, and in a lovely and quiet location on the second floor. Having access to the second pool and spa meant that on the weekend, when the main resort pool was very busy, we had a lovely place to take the kids and relax. We will be back again. Will definitely stay again if in this area, owners were a pleasure to deal with.